DC Victory Gardens: Planting Time! If you haven’t planted your seedlings yet, this weekend’s just about the perfect time. The weather today’s going to be up in the 70s, and we’re looking at 70s and 80s for the next five days, which means good soil temperatures, excellent conditions for planting. Why does soil temp matter? The higher the soil temperature, the quicker the germination for seeds, and the quicker your existing seedlings adapt to their new environment. With days and days of sun ahead, the only think you’ve really got to worry about is keeping things from drying out. Get out your planting gear and get ready to get hands deep in some loam. Time to hit up a Garden Store, or a garden section of a bigger store, for some planting mix. If you’ve got containers and soil left over from last year, that’ll work, too, but think about topping that off with a little mulch or mixing in some compost as part of your process. It’s easy to do this in a bucket: dump in last year’s soil, dump in some compost, and mix thoroughly, and then re-pot. Don’t forget to make sure that your containers need drainage. That’s what allows your soil to avoid getting over-watered, and it’s what help carries away some of the plant waste, as well. If yours are clogged, a good wash in the sink is good, and don’t be afraid to put a few extra holes in place. Find a good place in the sun for this weekend to maximize time in the light, if at all possible. Make sure to check every day that the soil isn’t drying out and caking in these warm temperatures. We’re still in the low-humidity portion of our Spring, which means that ambient moisture isn’t going to play a role in what you’re doing. Get a decent watering can, and maybe use the last of the growth accelerant that came in with your seed pod kit. Definitely won’t go amiss once your new preciouses are in the ground. Don’t forget to set up a climbing structure for those vine and creeper based crops like peas, beans and squash. Direct their growth up and off the ground where at all possible, to avoid spots for rotting. Read on for Back Yard Gardeners and the Farm Laboratory work. You may have a long hot weekend ahead of you. If you haven’t yet turned over any soil, you still have time to get a good bed setup. Pick out a good 4-foot by 10-foot area and put the shovel to good use. The rain this week should still have much of your yard soft and shovel-ready. Turn over all the dirt, working in compost or manure or even just garden soil from the shop. 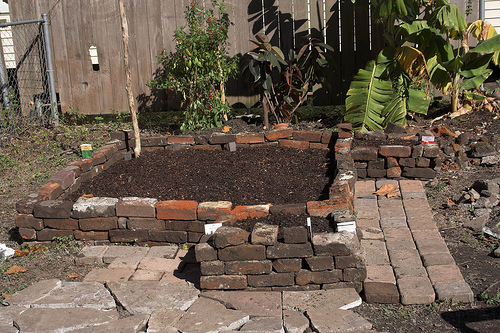 If you’re working in raised beds, set up a good perimeter and secure it, making sure to secure the beams or bricks in such a fashion that they won’t wander off when the soil settles. One of the tactics of the raised bed is to give you a good amount of soil you can control and add yourself instead of just depending on what mother nature has to offer. 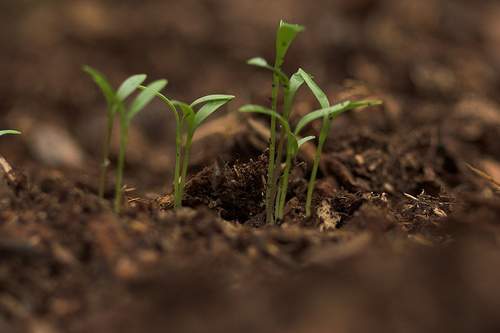 Setting up a good 4-6″ of quality soil will make up for what hard clay may lie beneath. Don’t just add it direct over hard clay, though, you’re going to want to break that up a bit at least. Planting here is the same as everywhere else: Make a depression in the soil deep enough for your seedling, tamp the seedling’s soil down a bit from on top, careful not to damage the tender stem, and then pop the pod out from the bottom of the container. Place the pod in the center of the depression, and smooth the soil back into place, mounding some extra right up against the stem. Give it a bit of water to help meld the seedling’s soil and the garden’s, and then check on it the next day. Hooboy. The blisters on my hands are fierce. We turned over all the soil about two weeks ago and started to add full compost. We’ve added Perc to the broken up heavy clay soil, and this week’s good soaking rain has likely been very therapeutic to conditions at the farm. If you’ve got a giant plot, this weekend’s the perfect time to do the final prep and start planting, even with the heat. Be sure to take water out, both for you and for the seedlings, and get ready to get the crops into the ground. We’re going to be planting some of just about everything, from beets and other root veggies to corn and melons and with last night’s frost warning likely the last we’ll see til late September, it’s time to make hay while the sun shines and get underway. We’ll have a map for everyone to see in the coming weeks. Got a question about your own situation? Either ask us in the comments section below, or don’t be afraid to email tom at we love dc dot com. We’re glad to answer your question! If we don’t know, we’ll go find a master gardener to ask. Happy Planting, and may the rain fall softly on your garden. Question: do people ever use perlite in their outdoor gardens, to lighten up the soil? I know it’s common to use in potting soil, but I was thinking I could mix a bag of it (and some Leafgro mulch) into my beds to keep the soil from being so damn heavy. Man, you guys are late! Our Capitol Hill garden has been giving us lettuce and spinach harvests for a week already, and our beets, broccoli rabe, and turnips are 6-8 inches high. Our parsley over-wintered, and the basil and cilantro is just starting to come up. We have raised beds that we filled with a shipment of soil from Merrifield Gardens a few years ago and have amended with compost and lasagna-style layering, but have never turned or tilled. Really, unless you’re starting from scratch, there’s no need to touch a shovel. We’ll plant tomatoes, eggplant, and peppers right among the cool-weather crops in a few weeks–once the weather gets warm, we’ll harvest the beets and turnips, and the greens will go to seed or die off just as the tomatoes start to ripen. It really depends on the soil. In the long run, you really want to shoot for having enough organic matter in the soil and the earthworms that will keep it broken up nicely. Depending on the amount of clay, you might need to add certain things like greensand or gypsum etc. Whatever you add, make sure that your balance is maintained. If any of the basics that a plant needs are missing or low, they’ll suffer. We’re using (at the farm laboratory) a combination of fully composted horse manure and “Complete Organic Fertilizer” ). This was made up by Steve Solomon (former owner of the Territorial Seed Company). His book, “Gardening When It Counts”, while having a bit of an apocalyptic bent, has a great wealth of information to gardening without the technology. There are some resources online for using Perlite but I don’t have any personal experience to speak to your question outside of a high level reply. Yeah, from the perspective of the master gardener like yourself, we are definitely late. We’re going after the folks who are new to gardening and may want to try something pretty straightforward for their first attempt, and who’re setting up their first garden. I’m super psyched to try some cold-weather crops this fall. What are you going to plant this fall? For us non-master gardeners that have a *lot* to learn and just aspire to just not kill everything this year, this was really helpful, thanks!! You can add perlite or other lightening media to your soil. Organic matter would do the same thing and also promote the soil’s vitality by providing food for the worms and other biota. The creatures growing in the soils do as good a job of aerating the soil as the perlite does. If your are working in a heavy clay soil, your need to modify the whole area. If you add amendments just around the planting holes, you are just creating little water-collecting buckets to grow in. If you need to greatly modify your native soil, your best bet is to grow in raised beds so you get nice free drainage.